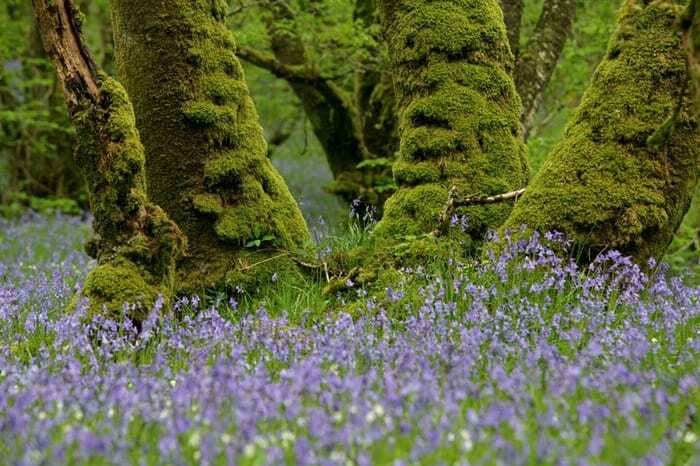 A quintessential sign of spring, the emergence of bluebells provide a glorious carpet of blue which sweeps across some of the UK’s best woodland. There are many places around the country you can witness and walk through bluebell woods. 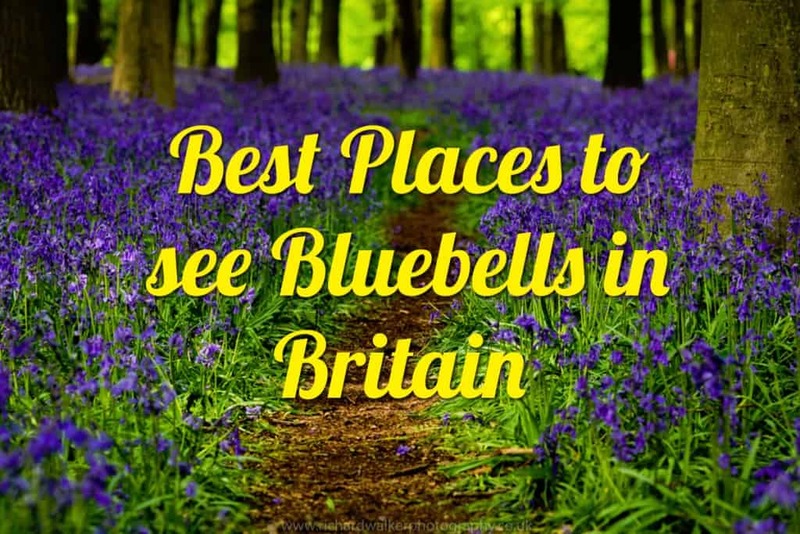 Here are the best places to see bluebells in Britain throughout April and May. Rumoured to bloom on St George’s Day, you can enjoy carpets of scented bluebells throughout the ancient woodland surrounding Nymans. 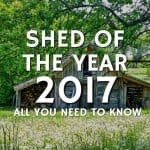 Described as a garden lover’s home for all seasons, you can enjoy an extensive yet intimate garden in Spring, set around a beautiful house and ruins. 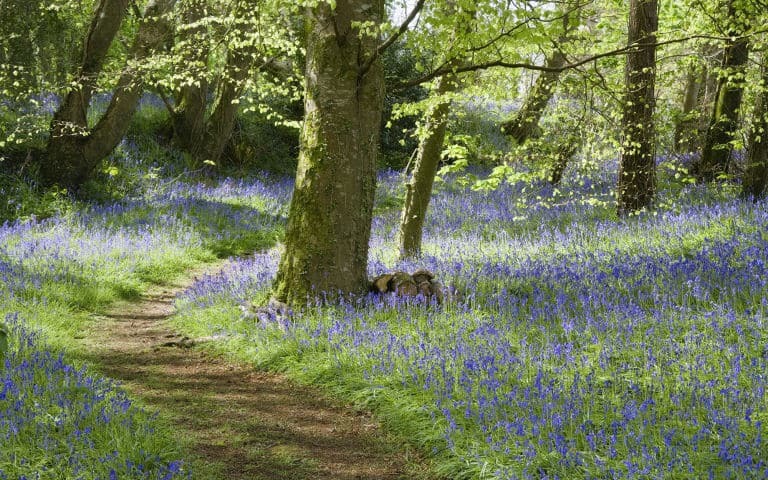 The garden and nearby woodland are perfect for walking, picnicking and spotting bluebells with your loved ones. 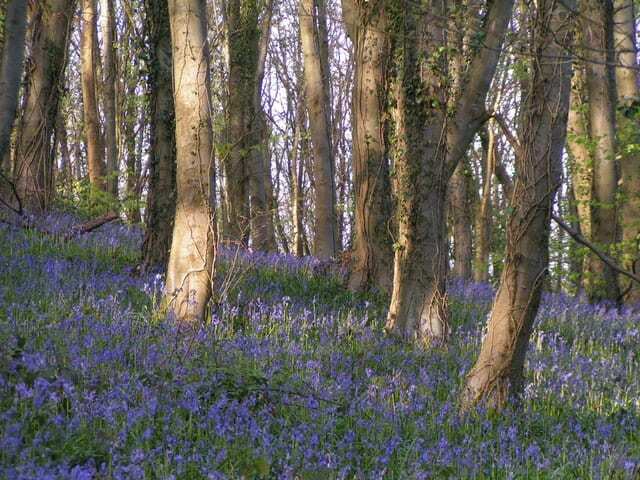 Home to a huge variety of wildlife, enjoy the 1.5mile woodland trail that displays carpets of bluebells in Spring. Also, take advantage of a ranger-led walk to witness the bluebells and discover a fascinating history behind the Ashridge Estate. 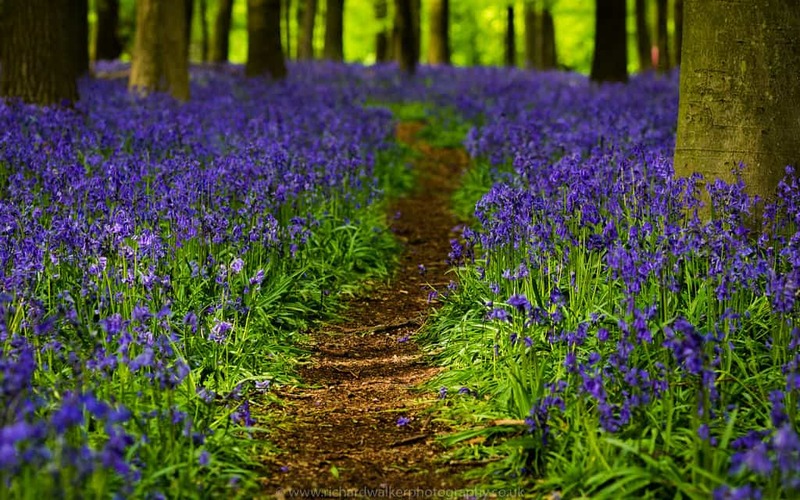 The bluebell walk is at its best from mid-April until Mid May. 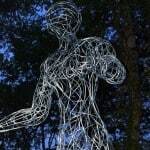 Once the country estate of the Dukes of Newcastle, Clumber Park offers a perfect escape with its magnificent lake, tranquil gardens and the expansive woodlands that come spring, are covered in stunning bluebells. You can also explore the Gothic-style chapel on the grounds of the park. 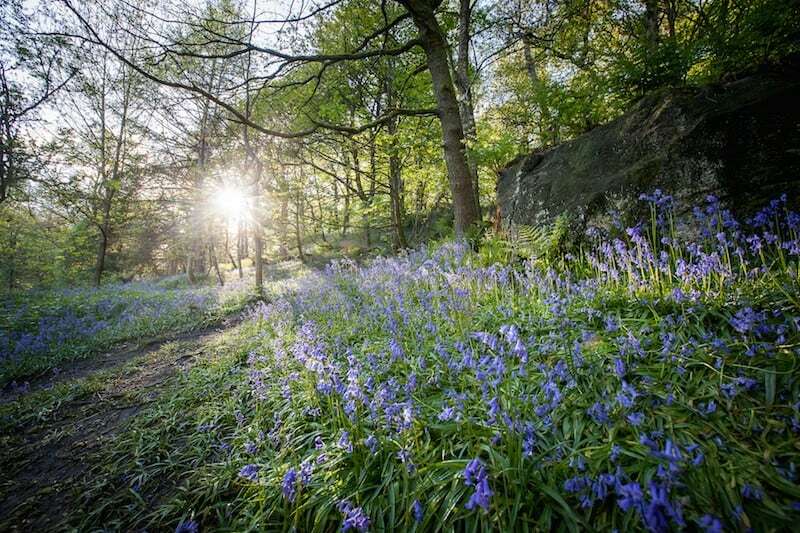 Set on a hilltop, this woodland is dominated by bluebells in the spring and has a circular footpath that is enjoyed by plenty of visitors and also popular with dog-walkers. 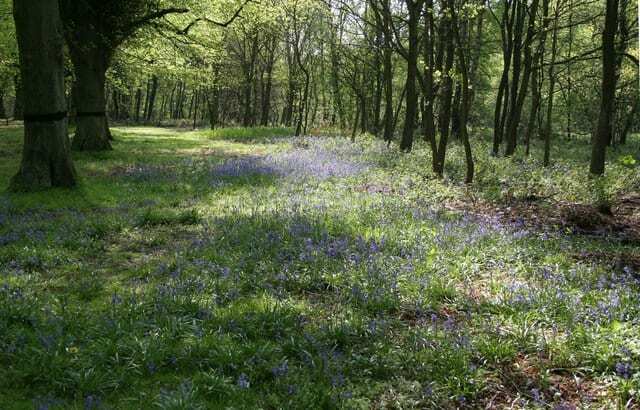 Coed Cefn consists of oak, beech, fir and sycamore and is surrounded by agricultural grazing. Located on the edge of Surrey Hills and surrounded by charming villages, this peaceful parkland is just 45 minutes from central London. Hatchlands Park is one of the largest country estates in Britain, which includes ancient woodland and open parkland. Enjoy views of the historic house and Surrey countryside. 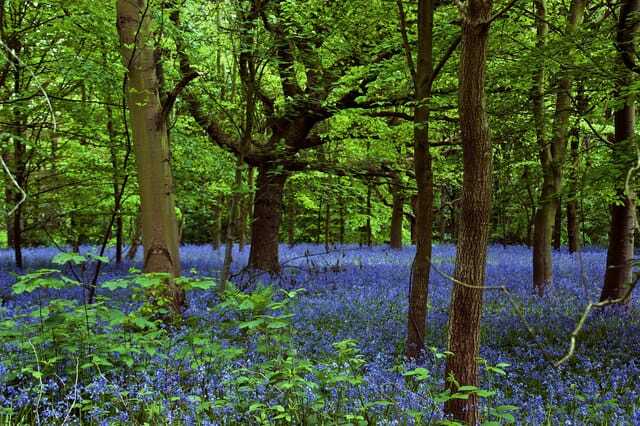 Wix’s Wood is home to carpets of bluebells which will appear in late April and early May. Bluebells are the undisputed spring highlight at Hardcastle Crags where they fill the woodland. 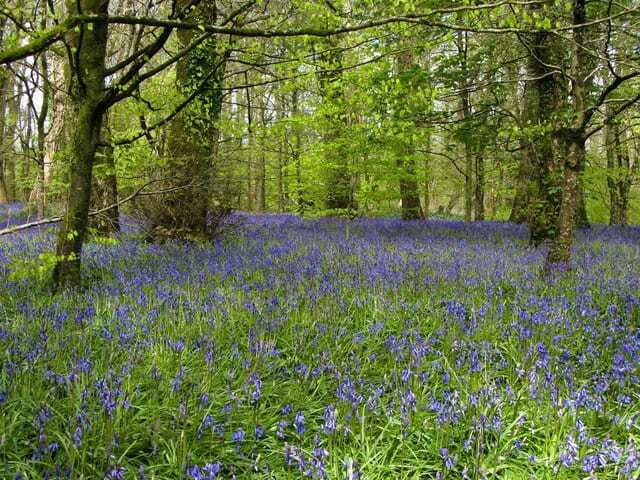 At their peak, usually, in May they create a stunning blue haze through the woodlands. 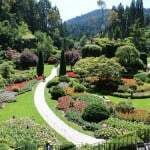 This landscape is often known as ‘Little Switzerland’ because of the valley sides, pathways and river. This magnificent country house Lanhydrock is accompanied by a wooded estate and fantastic gardens which are awash with bluebells and daffodils. 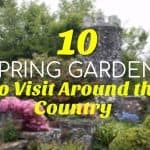 Enjoy the beautiful gardens with the whole family, Lanhydrock is well worth visiting in Spring. The Wood of Cree is full of life in Spring, with a vast scattering of bluebells and a perfect place to spot barn and tawny owls! This stunning woodland is well worth a visit as the largest ancient wood in southern Scotland, the Wood of Cree even has an otter platform that looks out onto the river. The beautiful Tudor manor that is Speke Hall is set on the River Mersey. Restored in the 19th century, this stunning house now offers delightful gardens as well as incredible views. The woodland walks ensure idyllic carpets of bluebells. Sissinghurst Castle was made famous in the 1930s when Vita Sackville-West and Harold Nicolson created a magical garden. 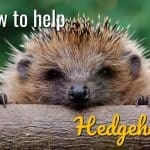 Sissinghurst is a great spot for enjoying wildflowers and wildlife spotting. 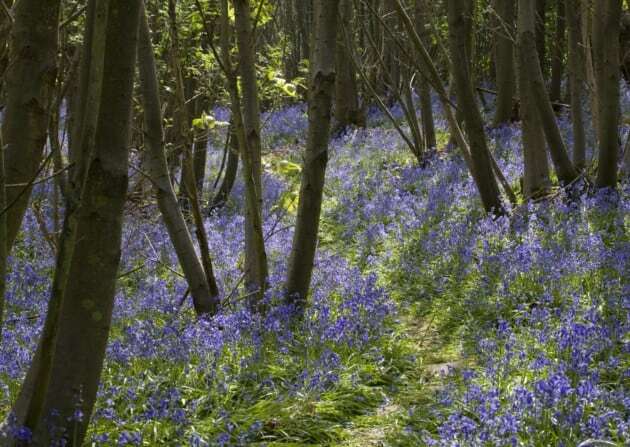 Take a Bluebell and Wildflower Walk led by Rangers to enjoy the vast covering of bluebells.